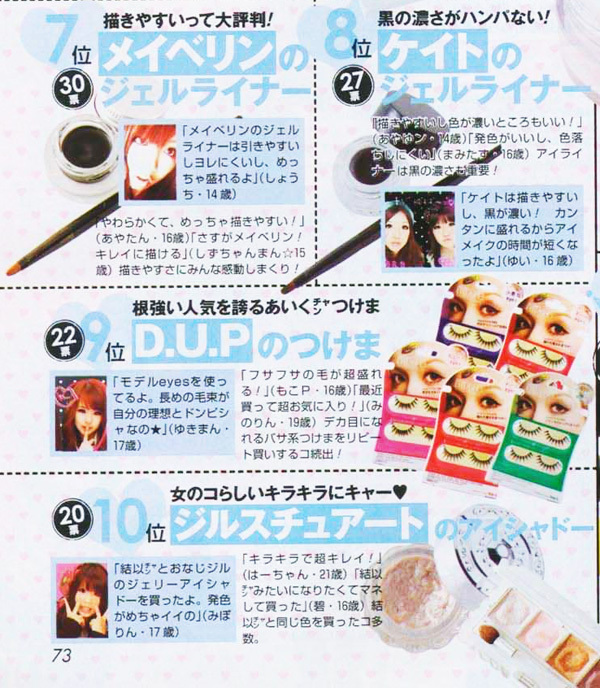 so here is popteen's 1000 gyaru survey post of top 2009 items! why: great pigments and quality, great pinky shades to create kawaii cheeks, very cheap, pW20 is everyones favorite shade, highly recommended! why: Looks so smooth and matte, covers spots, pore and imperfection really well without looking too heavy, looks very natural. Why: The smell is sweet but not too sweet and very girly scent. ooh thanks for posting up this! and thank you for helping me translate the Japanese words!! and you do not have to apologize!! do take care!! so cool! thanks thanks for sharing..
thanks for the post hun! Hi Eki!! Thank you for listing all of the products! 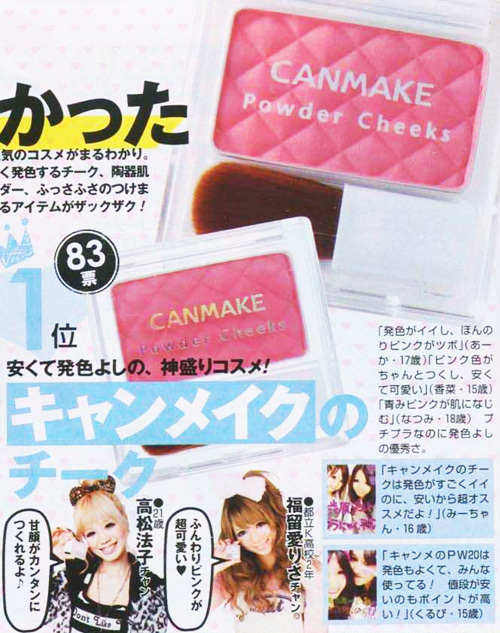 Really interesting to know what is popular :) Now I really want to try canmake blushes! Hey!! I'm a spanish girl!! 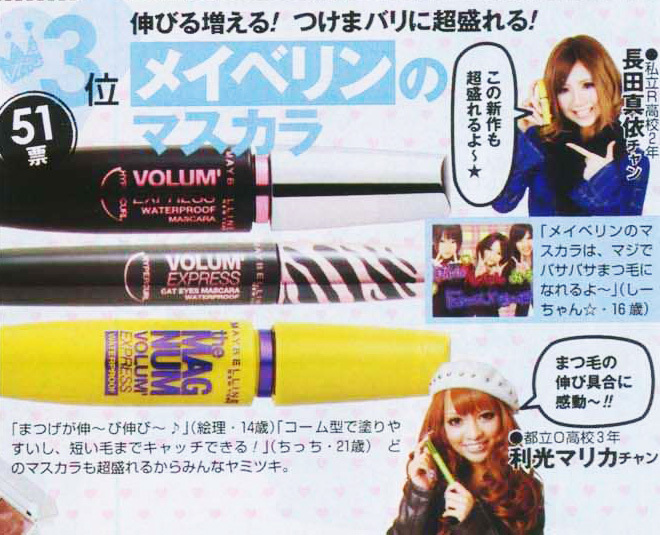 I love gyaru style!!! And this entry is cool, i like a lot!!! 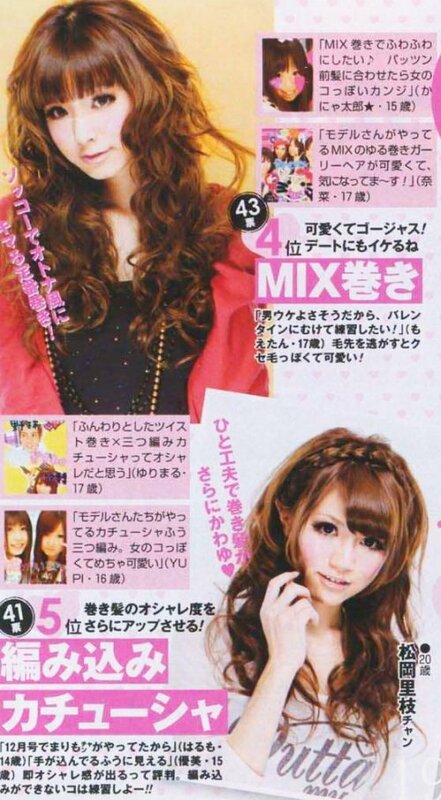 the best of fashion gyaru in 2009!! 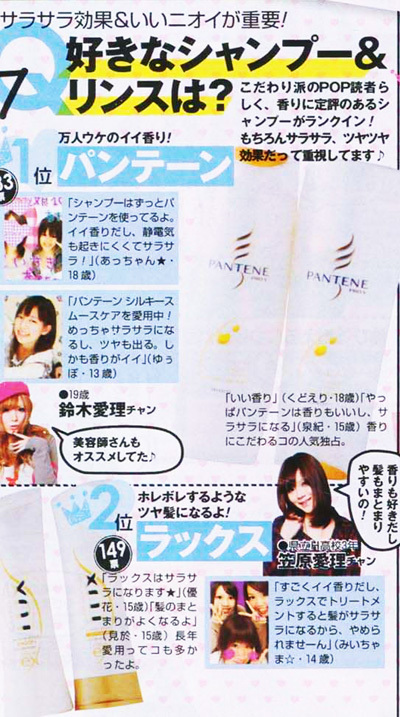 Thanks for the scans Eki! And extra thanks for breaking the list down for us! :) I wonder if the Donkihote is the same as our Don Quxiote down here?! Hrmm.. but I've never seen their own brand stuff before. Stay warm! HOpe you feel better soon! i got #3, #4, #10! im gonna collect all of them! thanks eki! i really like this post and find it useful, thanks eki!!!!!! Wow, thanks for the scans and breakdowns! I enjoyed reading and I'm totally picking my next conditioner from that list! Haven't tried any Canmake yet either - must check it out! Thanks for posting this :3. I also adore KATE eyeshadows, they are very soft and pigmented and good quality, i swear by them!